Alfred A. Knopf Books for Young Readers, 9780385753463, 359pp. Alex Myers is a quarterback, but from the first day of football practice, it's clear that that position is very much filled by the coach's son, Matt. Alex has the better arm, but Matt has more experience and the coach's loyalty. Alex finally gets a chance to show what he can do when Matt is injured, and he helps win a key game to keep the Lions bid for the state championship alive. But just when his star is rising, Alex gets blindsided the state has started drug testing, and Alex's test comes back positive for steroids. Alex "knows" that's not right. But he doesn t know if it's a mistake or if someone wants to make sure he can t play. . . .
John Feinstein has been praised as the best writer of sports books in America today ("The Boston Globe"), and this first installment in the Triple Threat series is his most thrilling and suspenseful novel yet. 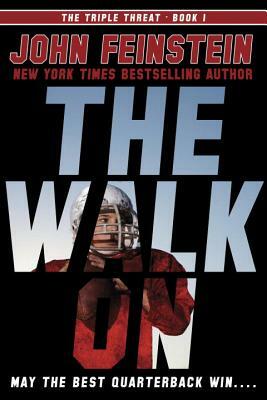 Fans of Mike Lupica, Tim Green, and Paul Volponi will want to check out "The Walk On, "and its companion, "The Sixth Man." A cliffhanger of a football novel bristling with social, personal, familial and ethical issues to complement the gridiron action. . . . All the goods for the sports enthusiast and more. "Kirkus Reviews. JOHN FEINSTEIN is the author of many bestselling books, including "A Season on the Brink" and "A Good Walk Spoiled." His books for young readers offer a winning combination of sports, action, and intrigue, with" Last Shot" receiving the Edgar Allan Poe Award for best young adult mystery of the year. He lives in Potomac, Maryland, and on Shelter Island, New York, with his family.